Sansei Singapore - Basins. Bathtubs. Faucets. Shower Equipments. Water Closets. 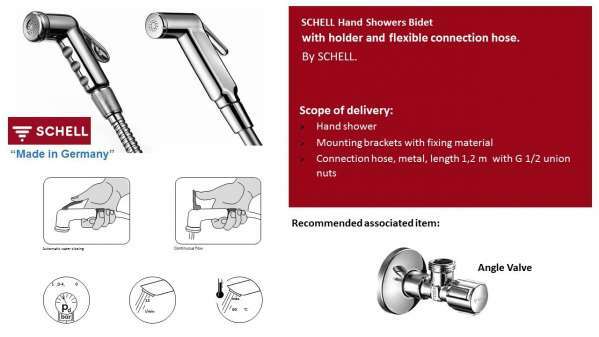 SCHELL Hand Showers Bidet If you choose SCHELL, you are choosing quality products “Made in Germany”. 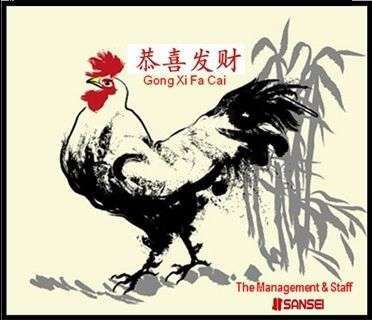 For the forthcoming Lunar New Year celebrations, our office and showroom will be closed from 15 to 20 Feb 2018. Business resume on 21 Feb 2018. Wishing you and loved ones a Happy & Prosperous Lunar New Year of the Dog. 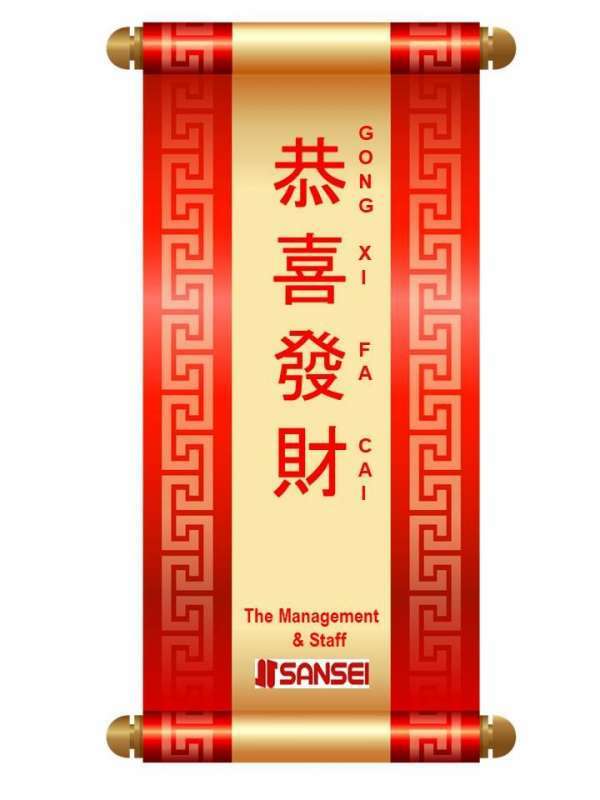 Dear Valued Clients & Business Partners, Our office will be closed from 27 Jan - 05 Feb 2017 for Chinese New Year. We will resume work on 6 February 2017. 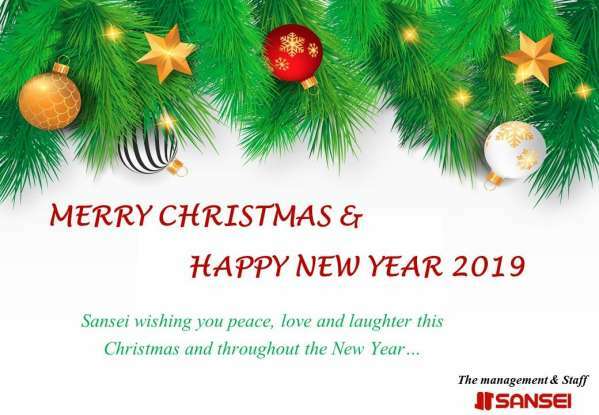 Dear Valued Clients & Business Partners, Our office will be closed on New Year's Eve, 31 December 2016. 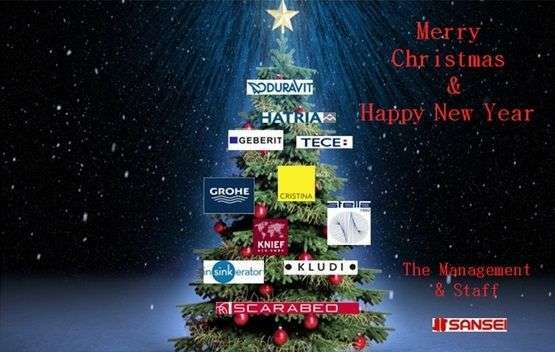 Wish you a Happy New Year!!! ~Innovation in your kitchen, cleaner, more convenient and environmentally responsible~ At the touch of a button, food waste is dealt with hygienically and instantly rather than leaving it in a bin to encourage smells, bacteria and insects. 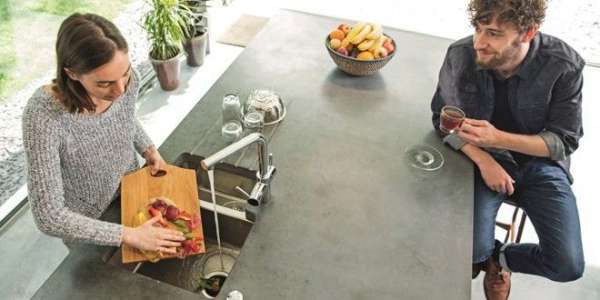 And InSinkErator® food waste disposers don’t just offer practical, contemporary convenience; they provide an environmentally sound answer to the growing problem of food waste. No less than 20% of household waste is food waste. KLUDI LOGO NEO - The logical choice Sleek lines and reliable technology are what characterise KLUDI LOGO NEO as a member of the KLUDI family of mixer. The flat spout and the precise edges are typical of the practical use of form. KLUDI LOGO NEO makes it easy to choose a quality mixer. Designed for Scarabeo Ceramiche, the bathroom system Fuji is born from the request to realize a functional, declinable and a strong personality product. 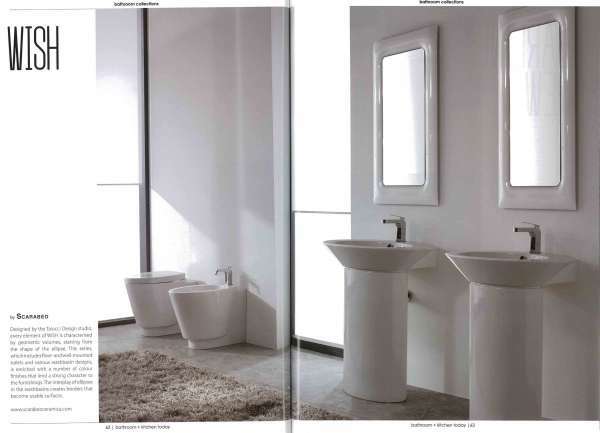 The collection Fuji is characterised by soft and essential lines that, beginning with the washbasin are then proposed in the other elements of the bathroom system. Thanks to some simple correction on details and accessories, Fuji is able to configure a functional and complete bathroom environment. 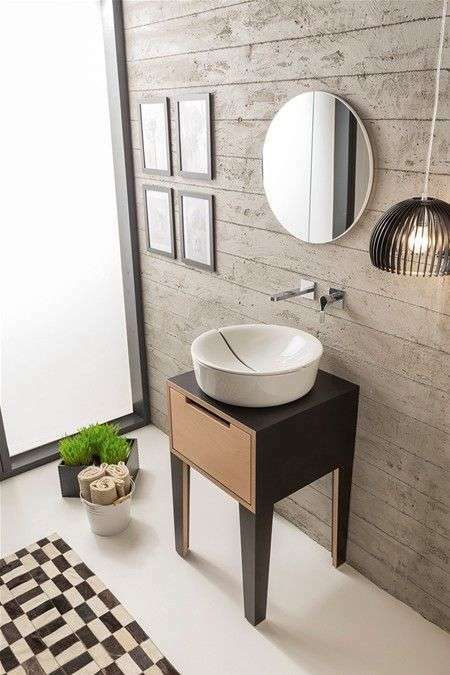 Designed by Emo design, is an elegant ceramic washbasin. It represents an innovative solution that rethinks the object’s traditional architecture. 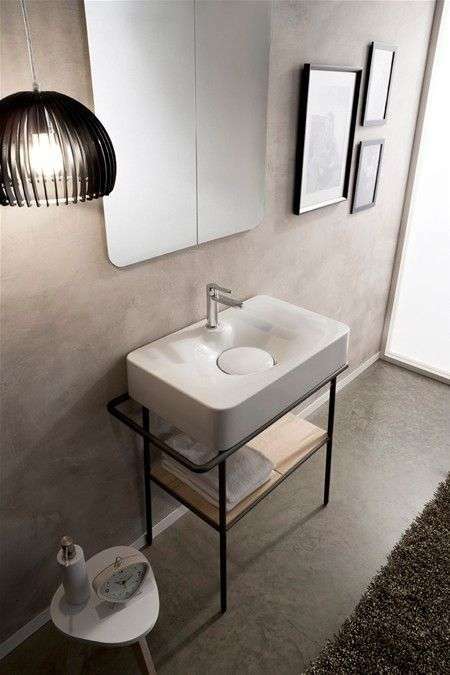 Here the washbasin is thought like a volume composed of many components that define the external shell. The central cut of the superior cap, which designs the object’s graphic, drains the water in the bowl, where the drain hole is hidden. Absolute modern classic! Inspired by the last century this bathtub with its pure aluminum (brushed) outer ergonomically interprets classic tub design in the spirit of time. 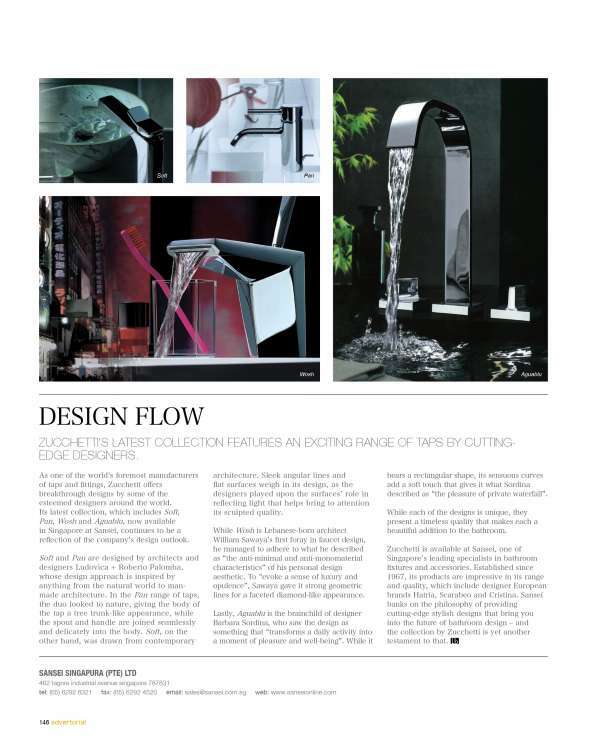 Its special, unique and outstanding design is an eye catcher for your bathroom! 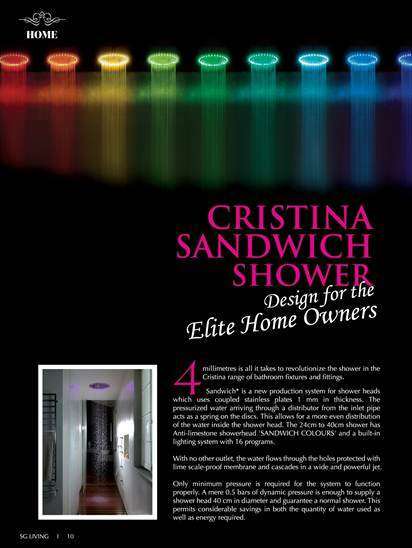 Our Cristina's Sandwich rainshower was featured in the latest issue of Home+Living magazine. 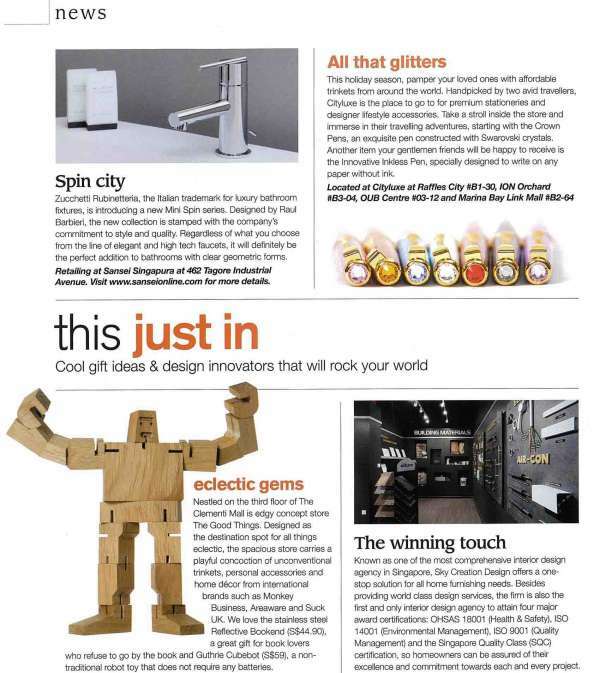 Our various range of sanitarywares and fittings were featured in Propertyguru's latest issue of The Ultimate Interior Design Journal! 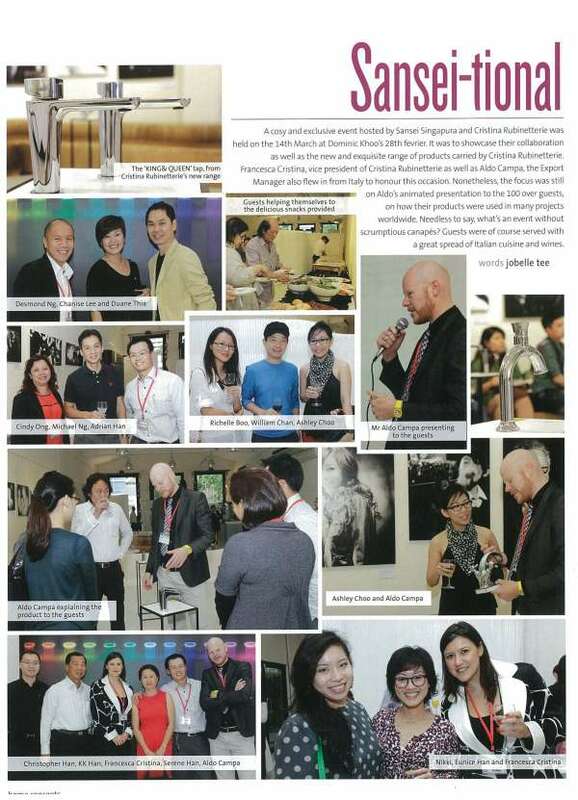 Our newly revamped showroom was featured in the latest issue of SquareRooms magazine. 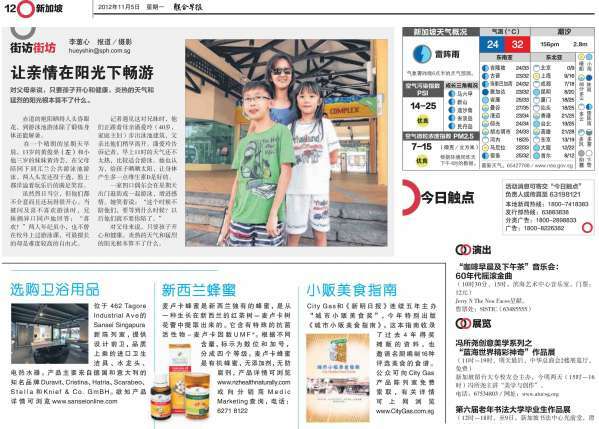 Our newly revamped showroom was featured in today's edition of Lianhe Zao Bao (05th Nov). 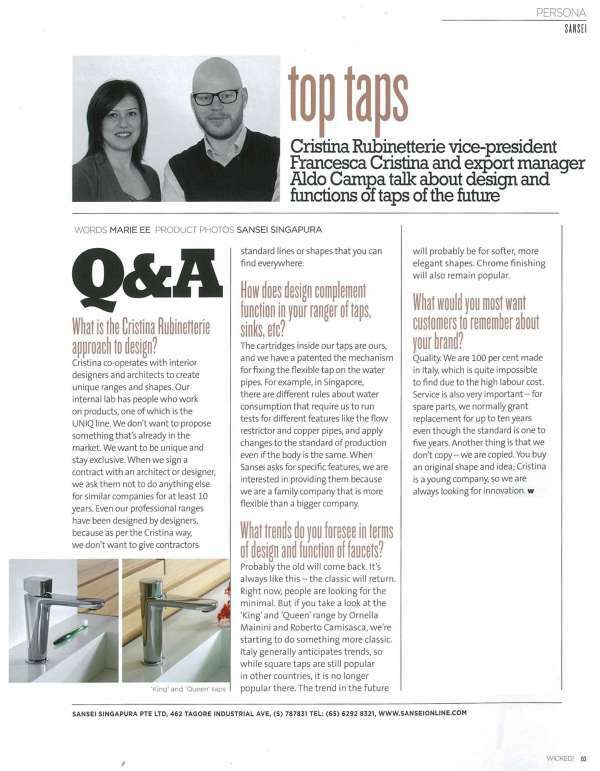 Here's another great interview with Cristina Rubinetterie in the latest issue of Wicked! 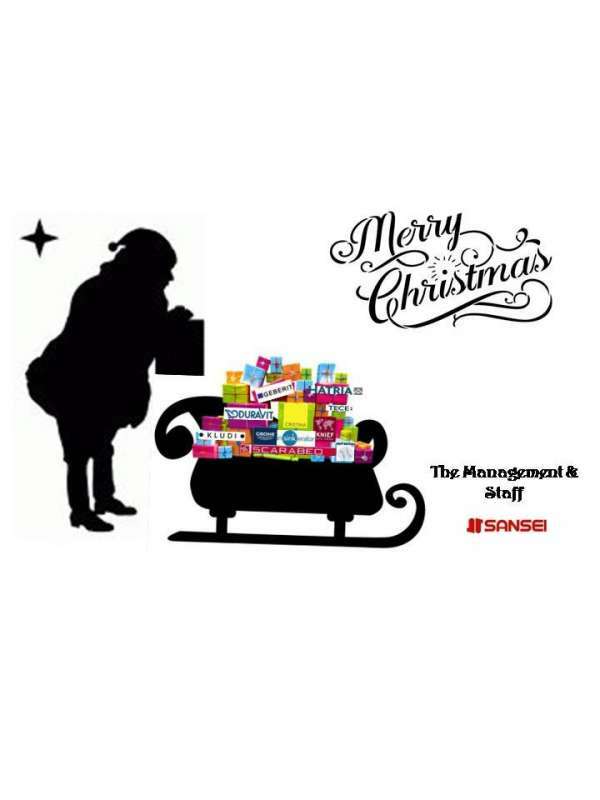 magazine 2012. Get to know why their exquisite range of fittings are different from others. 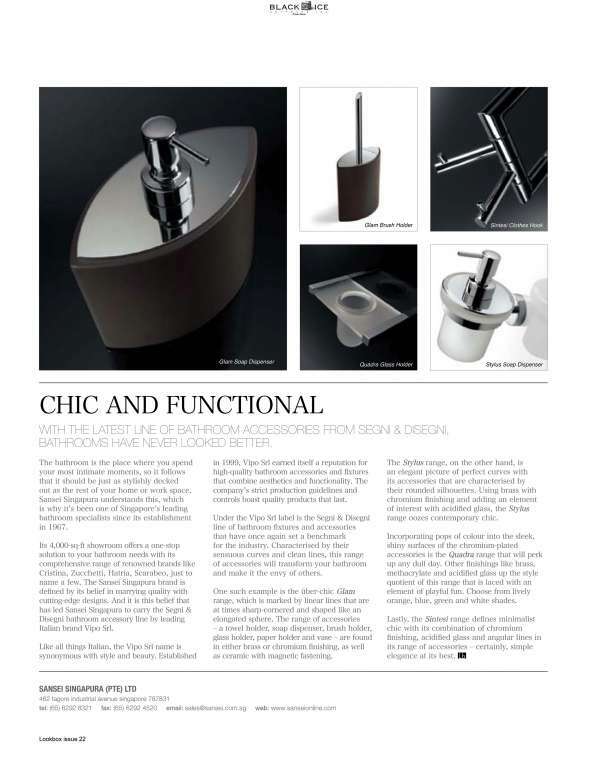 Looking for the ideal sanitary fittings or wares for your new or existing bathroom? 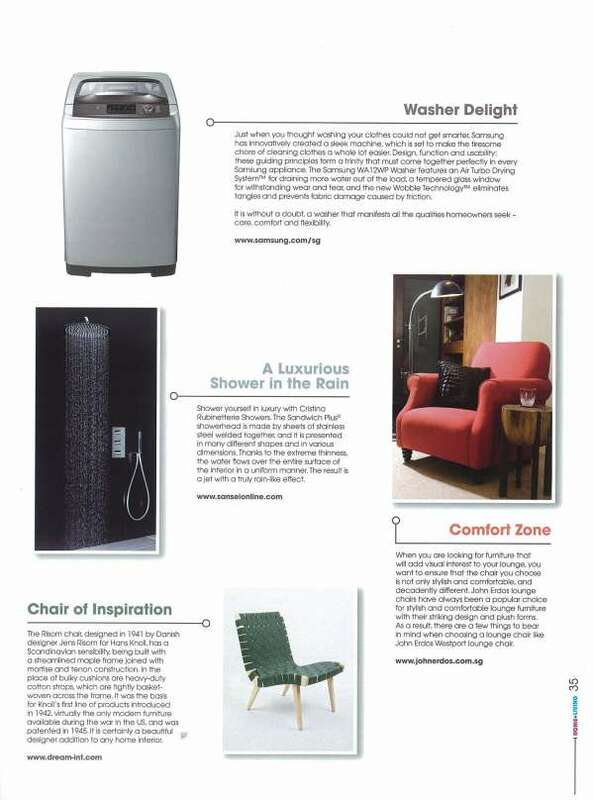 Propertyguru's Design Lookbook highly recommends our range from Duravit, Cristina, Stella and Scarabeo in their latest issue. 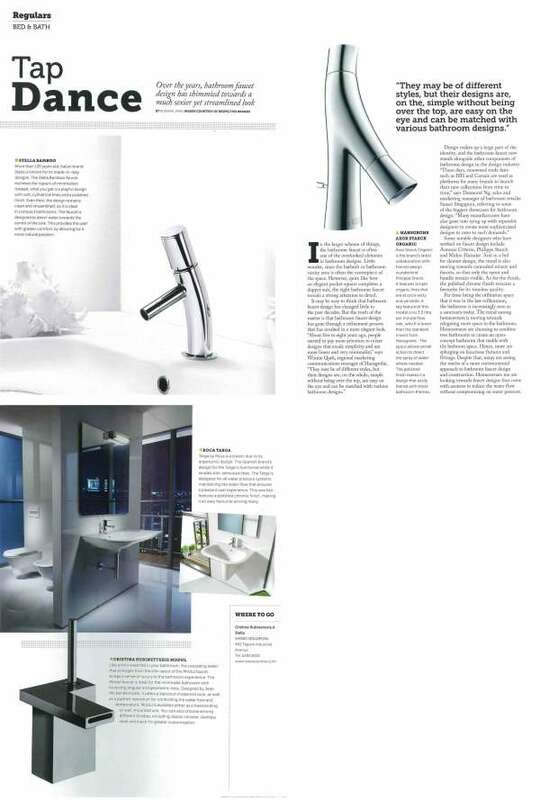 Our Hatria's G-Full, an integrated one-piece sanitary fitting system that combines the functions of the WC and bidet in a single ceramic surface, was featured in Bathroom+Kitchen Today magazine. Looking for the ideal bathtub for just the both of you for your new or existing bathroom? 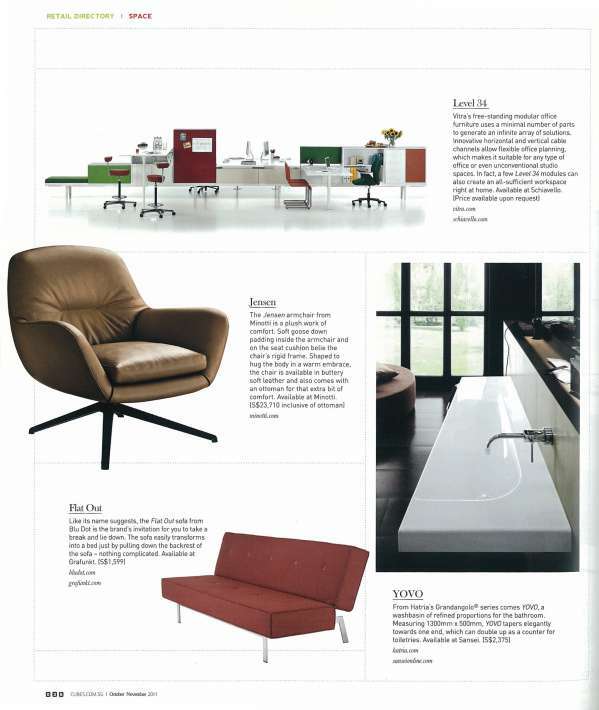 Square Rooms recommends Duravit Starck free standing bathtub to their readers in the September 2012 issue. Looking to glam up your bathroom? 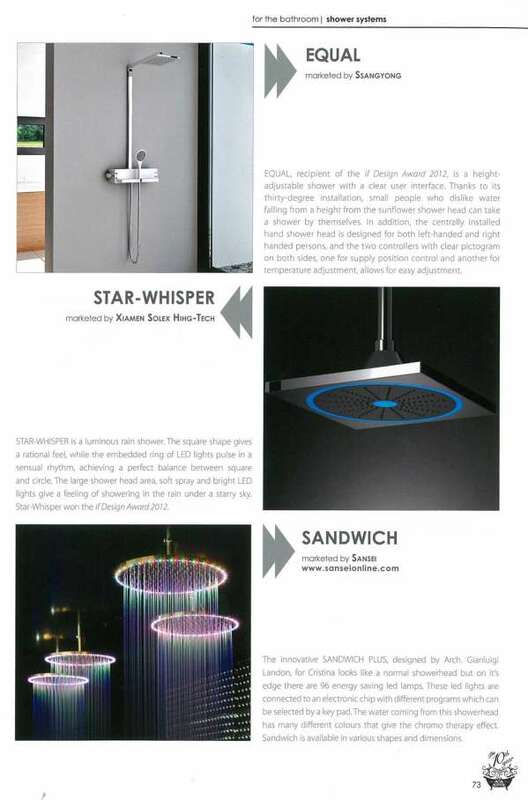 Square Rooms magazine suggested some ways to attain bathroom bliss and Cristina Sandwich Colors rainshower and Hatria's Happy Hour washbasins were highly recommended to their readers! 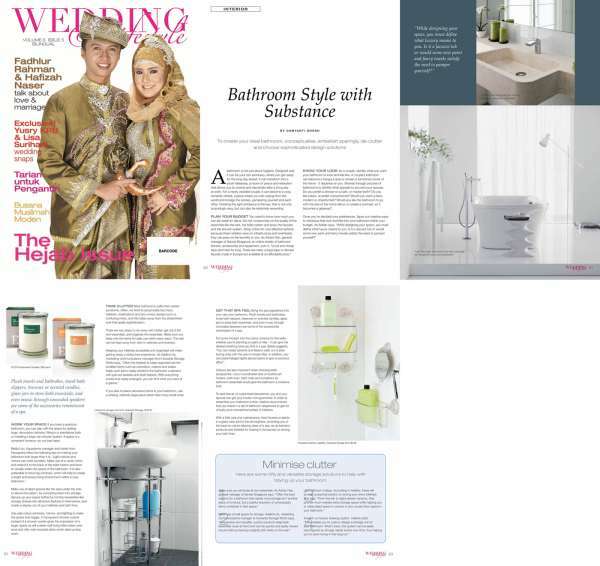 Wedding & Lifestyle magazine shares with their readers on how to create your ideal bathroom, incorporating with some of our exquisite products. 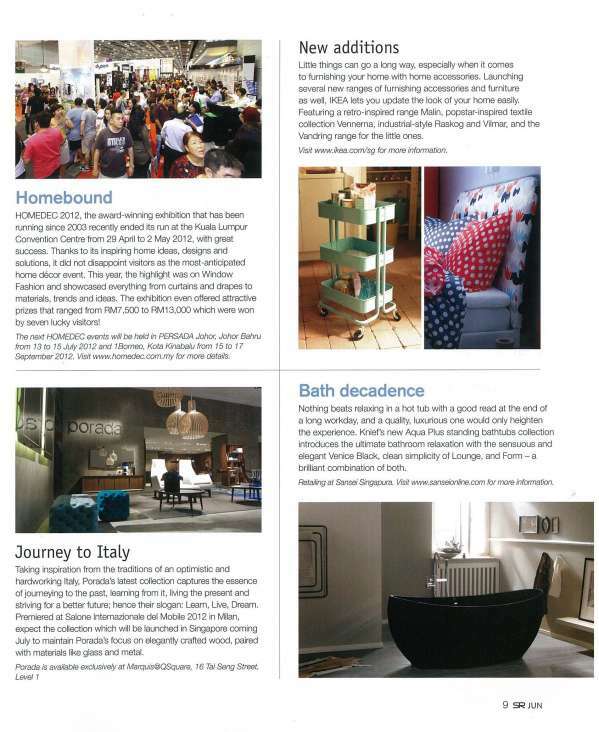 Our intimate bash with Cristina Rubinetterie was featured in Home Concepts July'12 issue. 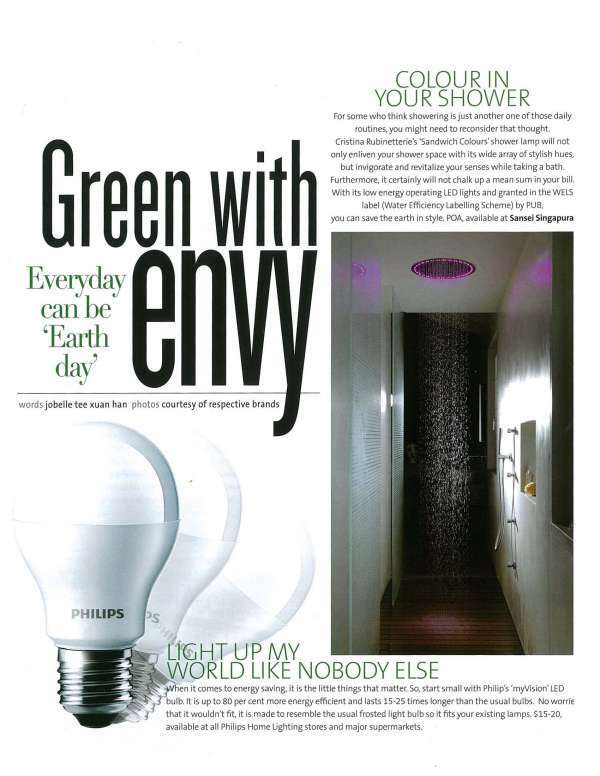 Cristina Rubinetterie's Sandwich Colours rainshower, which was featured in Home Concepts July'12 issue, operates using LED Lights, allowing one to help to save the earth in style. 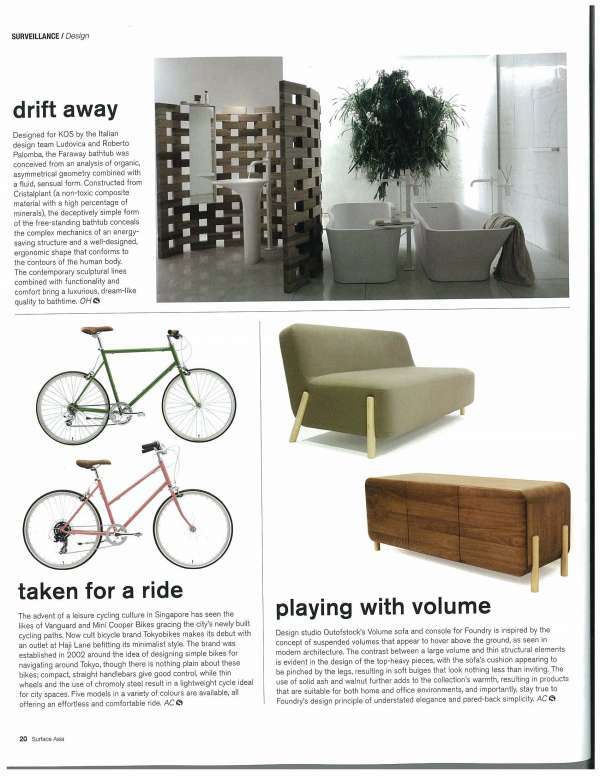 Square Rooms introduces our Knief & Co.'s Venice Black bathtub - an extension to their already impressive Aqua Plus collection, in their latest June 2012 issue. 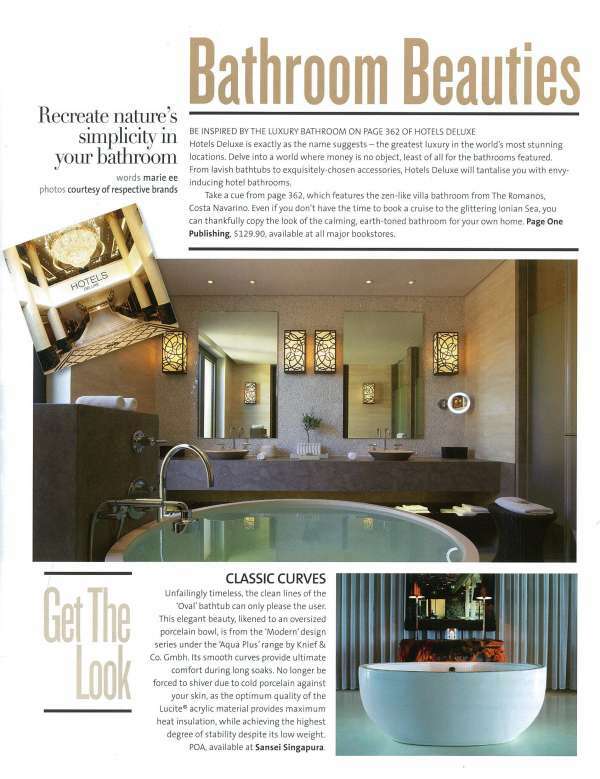 Knief & Co. 'Oval' bathtub, under their 'Modern' design series, was featured in Home Concepts latest issue. Designed by Talocci Design Studio, Scarabeo Wish collection is enriched with a number of colour finishes that lead a strong character to the furnishings. 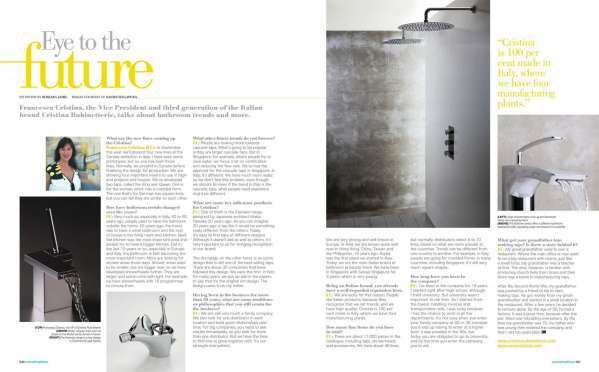 PURE magazine, published by PUB, the national water agency, offers an entertaining and informative read about water and environmental issues, shares with their readers on how to create a trendy yet eco-friendly bathroom using our products. 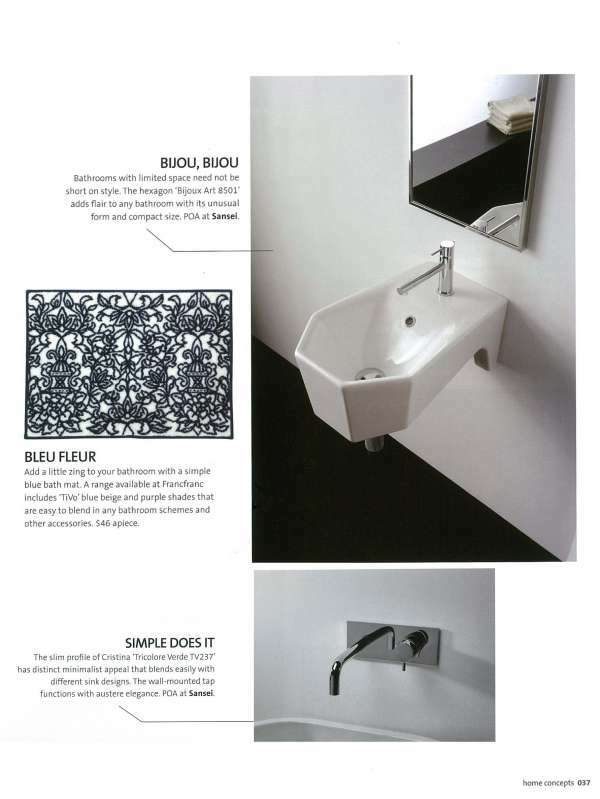 A great bathroom concept done up by one of our client, incorporated with our Serel's WC and Hatria's washbasin, was featured in the latest Home & Decor March 2012 issue. Designed by renowned Phoenix Design, Duravit PuraVida Bathtub subtly creates this much-desired atmosphere with white LED lights lacing the rim in a soft sensual glow. 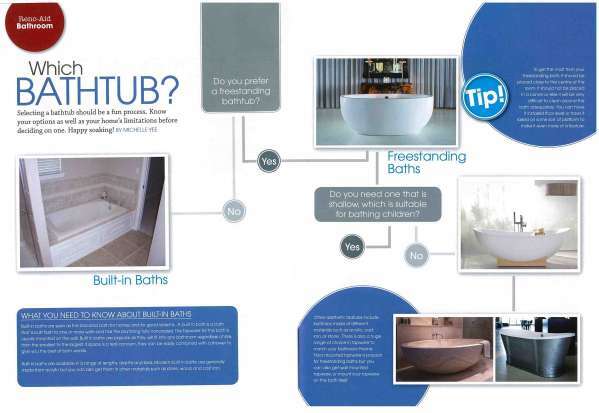 Looking for the right bathtub for your new or existing home? Seeking the ideal one should be a fun process! 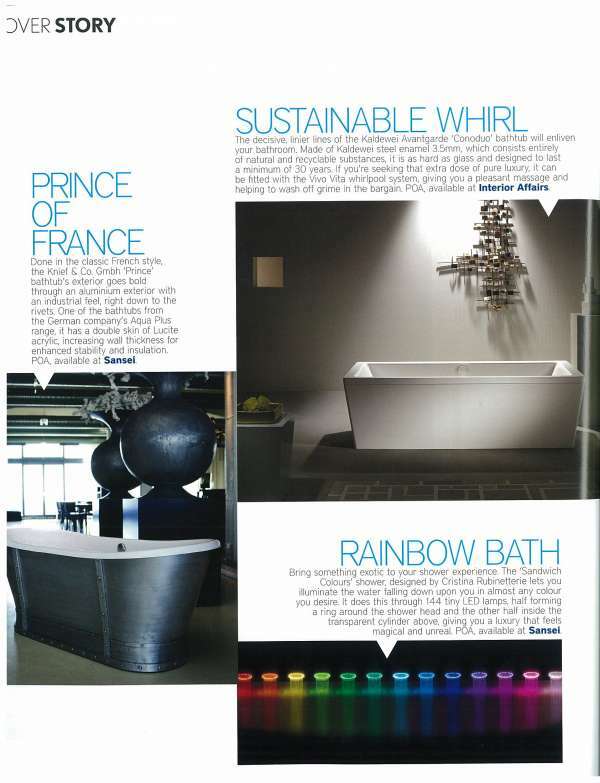 Home+Living magazine recommends both our Knief & Co's Oval and Prince bathtub to their readers in their Issue 5. Wicked! 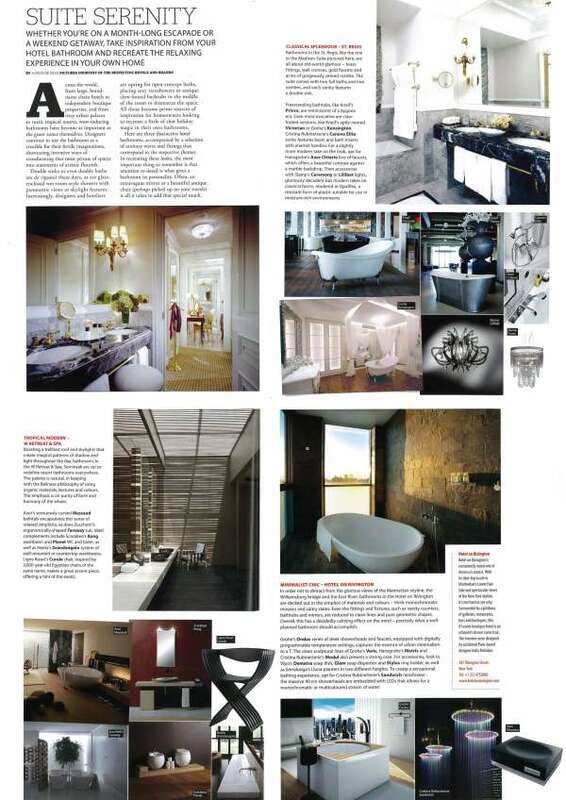 magazine shares with their readers on Cristina Rubinetterie, a leading bathroom brand available exclusively at Sansei Singapura, that innovates and set trends. 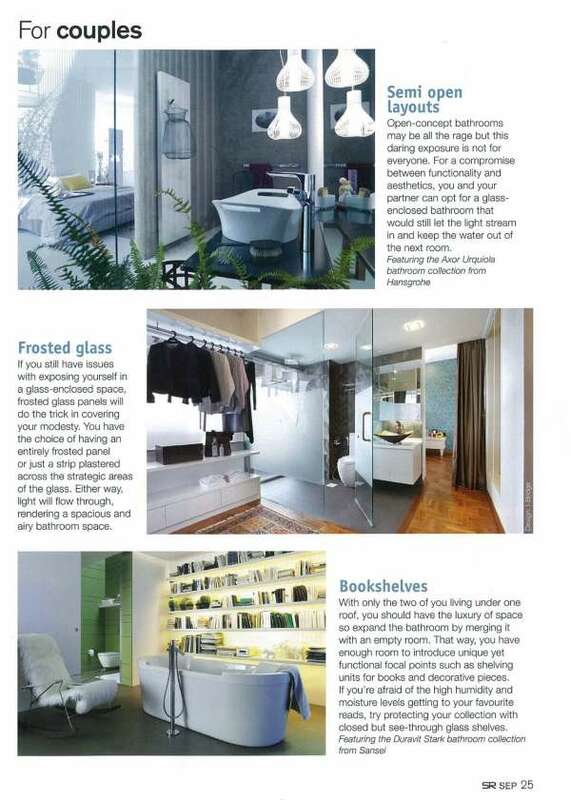 Whether you are on a month long or just a weekend getaway, Singapore Tatler Homes magazine shares with their readers on how to take inspiration from the hotel which you have stayed in and create or recreate the sensual experience, incorporated with our unique products, into your own home! Cristina Rubinetterie launched their latest collections during the renowned CERSAIE fair held recently in Italy and one of the main highlight was their King Tap,designed by MC2 Architetti Associati. Like the name itself, the King tap is squared in design, strong and masculine. Designed by Raul Barbieri, this new collection is stamped with the company's commitment to style and quality. Regardless of what you choose from the line of elegant and high tech faucets, Zucchetti Mini Spin will definitely be the perfect addition to your bathroom. 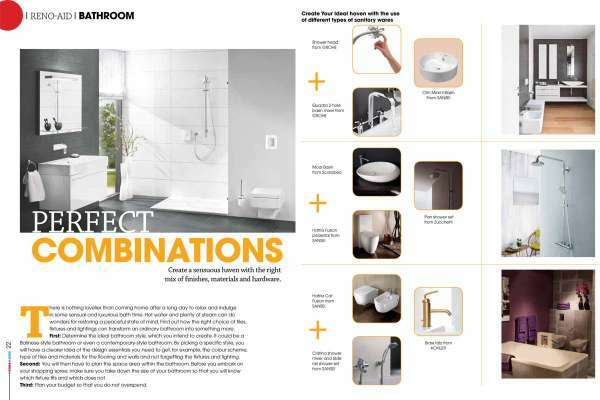 Planning to create or recreate your ideal bathroom with the right tap or mixer? With a myriad of varieties out there, one is bound to be spoilt for choice. 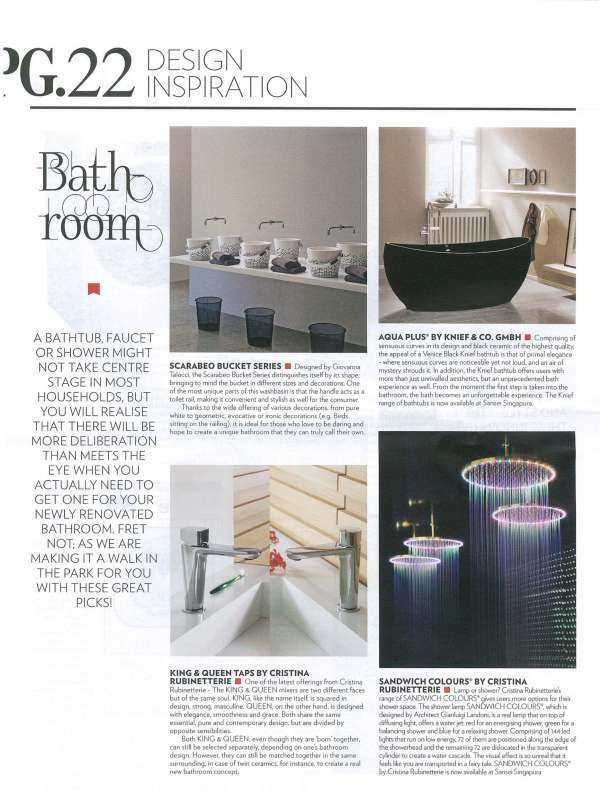 Home+Living highly recommended a few and Cristina Rubinetterie\'s Tricolore Verde and Canova Elite mixers were given the thumbs up as the perfect addition to one\'s dream bathroom. 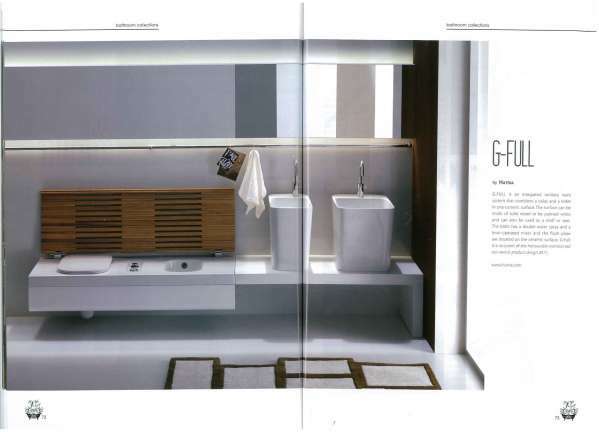 From Hatria's Grandangolo series comes YOVO, a washbasin of refined proportions for the bathroom. Measuring 1300mm x 500mm, YOVO tapers elegantly towards one end, which can double up as a counter for toiletries. 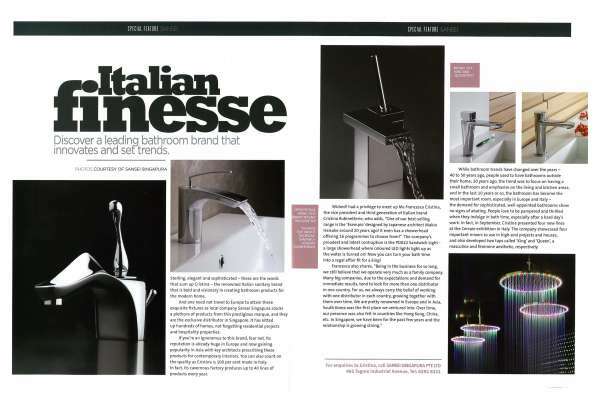 Francesea Cristina, the vice president and third generation of Italian brand Cristina Rubinetterie, shares her views on the company and her thoughts on bathroom trends. Cristina Rubinetterie has been around for many years. 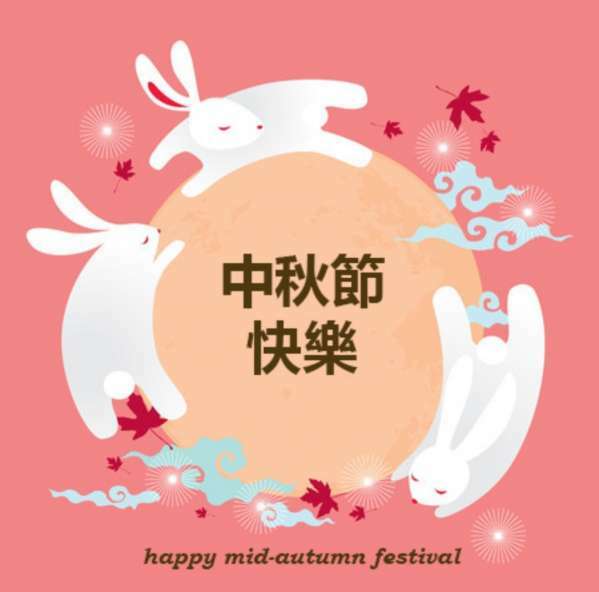 What are some of the traditions that your company maintains? Being in the business for so long, we still believe that we operate very much as a family company. 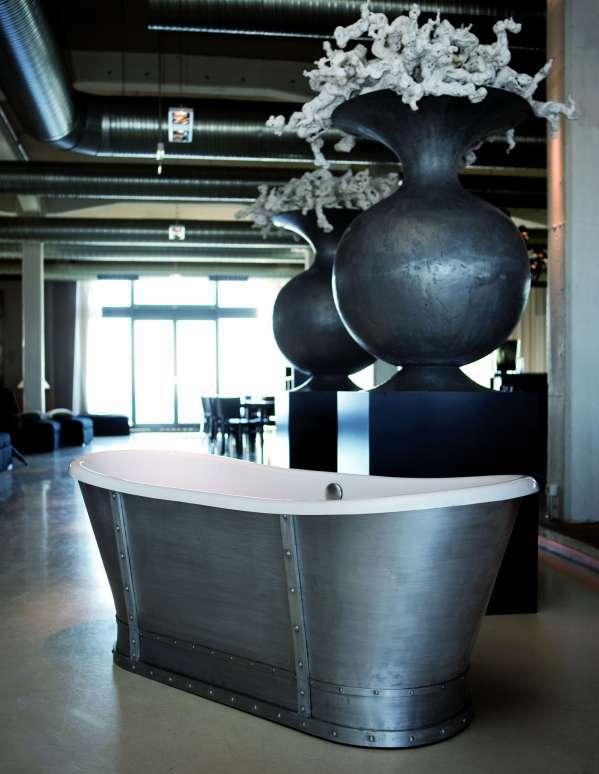 Done in the classic French style, the Knief & Co. Gmbh "Prince" bathtub's exterior goes bold through an aluminium exterior with an industrial feel, right down to the rivets. One of the bathtubs from the German company's Aqua Plus range, it has a double skin of Lucite acrylic, increasing wall thickness for enhances stability and insulation. 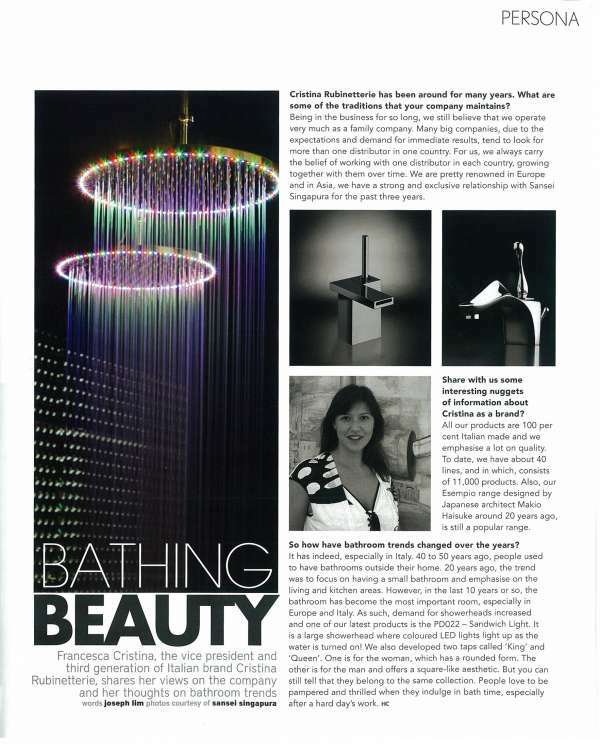 Francesea Cristian, the Vice President and third generation of the Italian brand Cristina Rubinetterie, talks about bathroom trends and more. What are the new lines coming up for Cristina? Francesea Cristina (FC): In September this year, we'll present four new lines at the Cersaie exhibition in Italy. I have seen some prototypes, but no one has seen those lines. The bathroom is the place where you spend your most intimate moments, so it follows that it should be just as stylishly decked out as the rest of your home or work space. 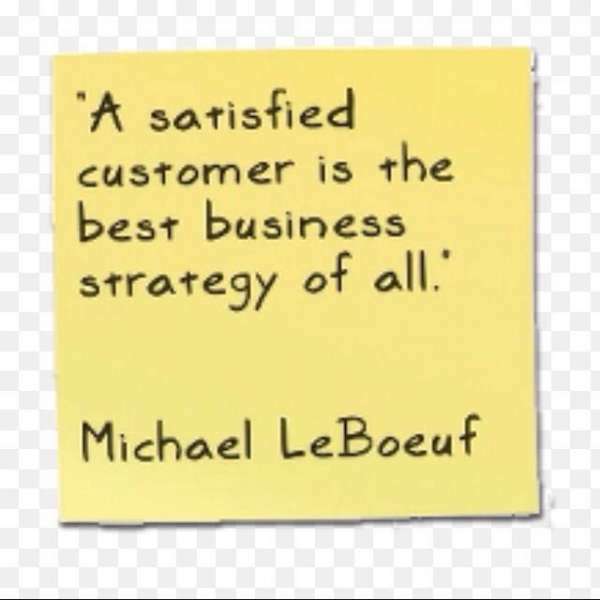 Sansei Singapura understands this, which is why it's been one of Singapore's leading bathroom specialists since its establishment in 1967. It's 4,000-sq-ft showroom offers a one-stop solution to your bathroom needs with its comprehensive range of renowned brands like Cristina, Zucchetti, Hatria, Scarabeo, just to name a few. 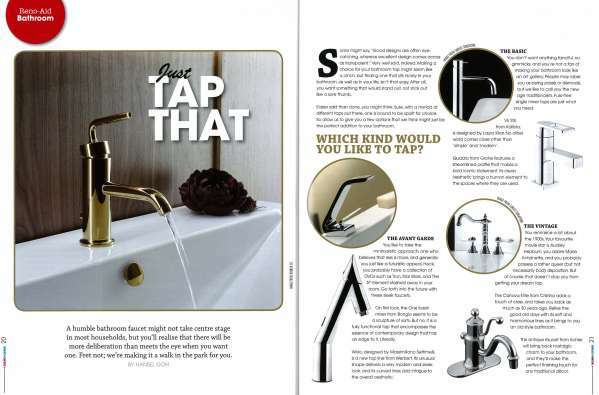 As ne of the world's foremost manufacturers of taps and fittings, Zucchetti offers breakthrough designs by some of the esteemed designers around the world. Its latest collection, which includes Soft, Pan, Wosh and Aguablu, now available in Singapore at Sansei, continues to be a reflection of the company's design outlook. Soft and Pan are designed by architects and designers Ludovica + Roberto Palomba, whose design approach is inspired by anything from the natural world to manmade architecture. 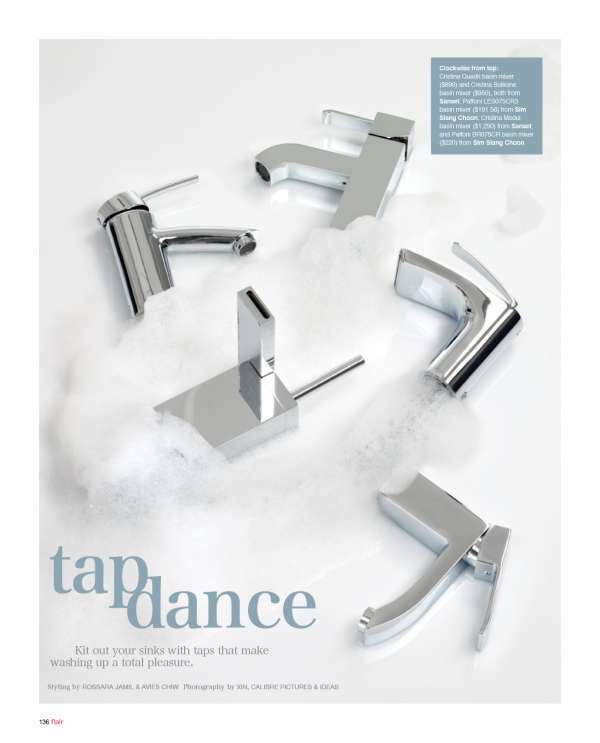 Tap Dance - Kit out your sinks with taps that make washing up a total pleasure. There is no over looking bathroom design these days, even when it comes down to the smallest detail. Connection pipes - those found between sinks, bidets and water mains - have come under the scrutiny of the design-conscious. 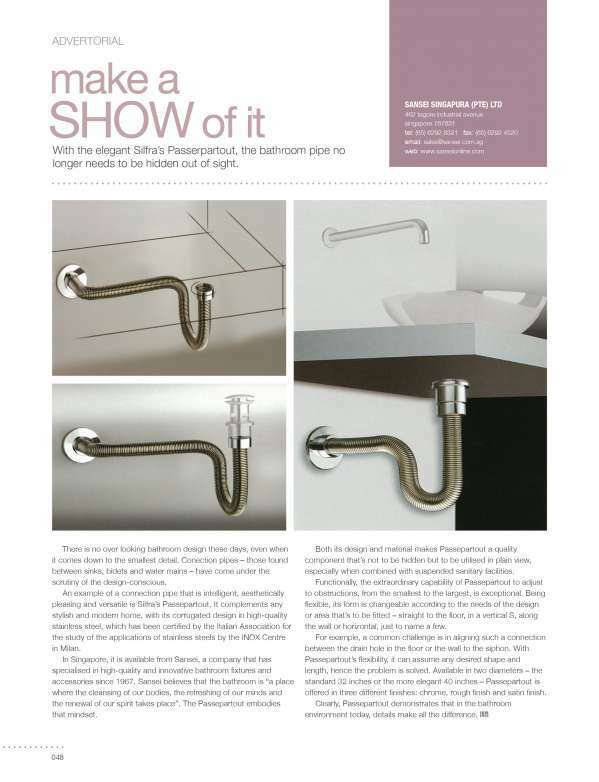 An example of a connection pipe that is intelligent, aesthetically pleasing and versatile is Silfra's Passerpartout. It complements any stylish and modern home, with its corrugated design in high-quality stainless steel, which has been certified by the Italian Association for the study of the applications of stainless steels by the INOX Centre in Milan. Hand-held showers slot into brackets that are either fixed to the wall or on a riser rail so you can adjust its height and they are connected by a flexible hose. These do not look as sleek or streamlined as fixed heads. 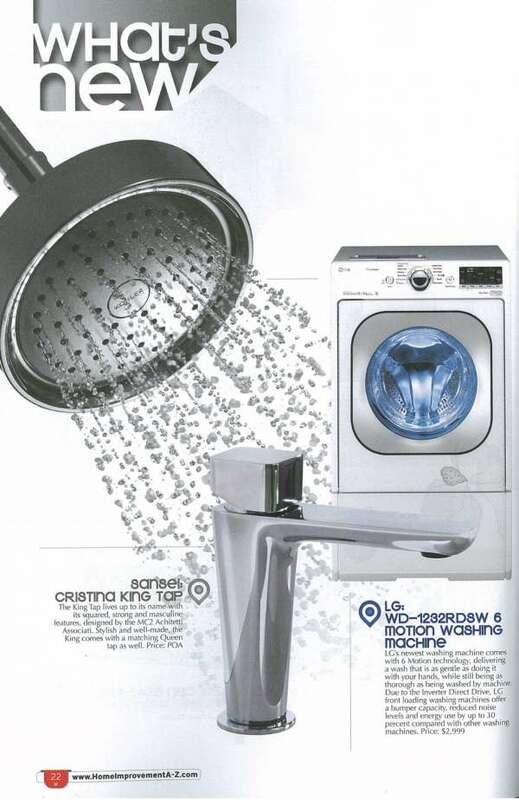 But the great advantage is that you can detach them for focused rinsing and easy cleaning of the shower enclosure. There is nothing lovelier than coming home after a long day to relax and indulge in some sensual and luxurious bath time. 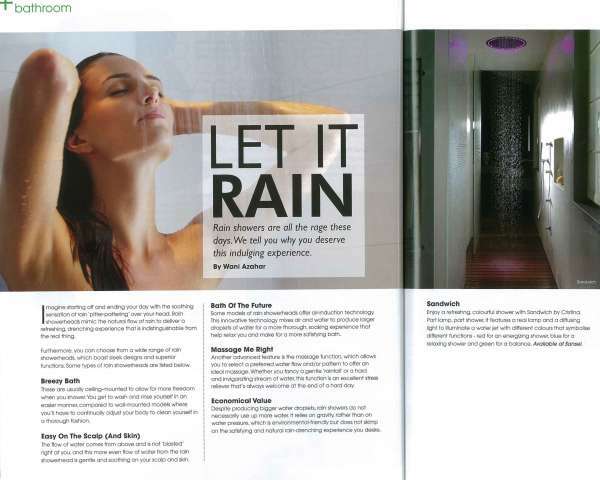 Hot water and plenty of steam can do wonders for restoring a peaceful state of mind. 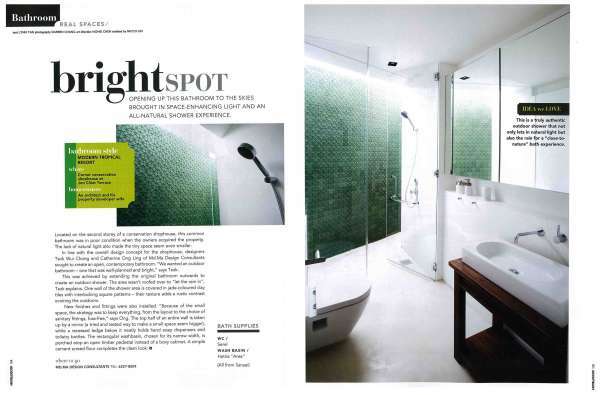 Find out how the right choice of tiles, fixtures and lightings can transform an ordinary bathroom into something more. 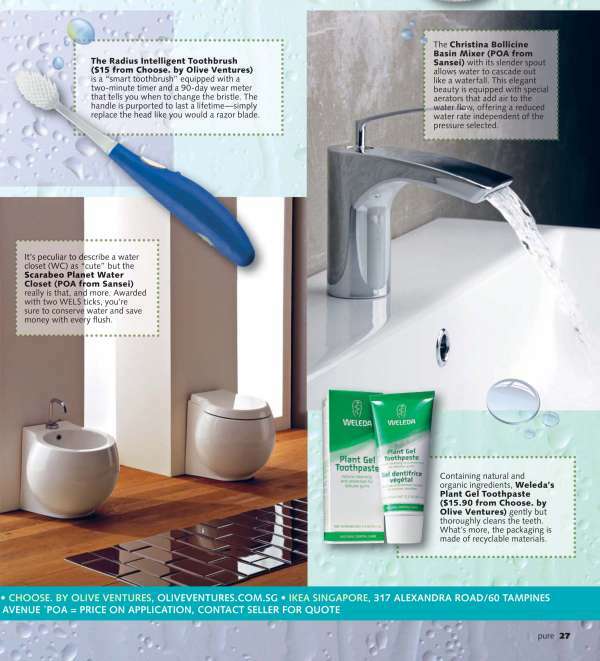 First: Determine the ideal bathroom style, which you intend to create. It could be a Balinese-style bathroom or even a contemporary-style bathroom. 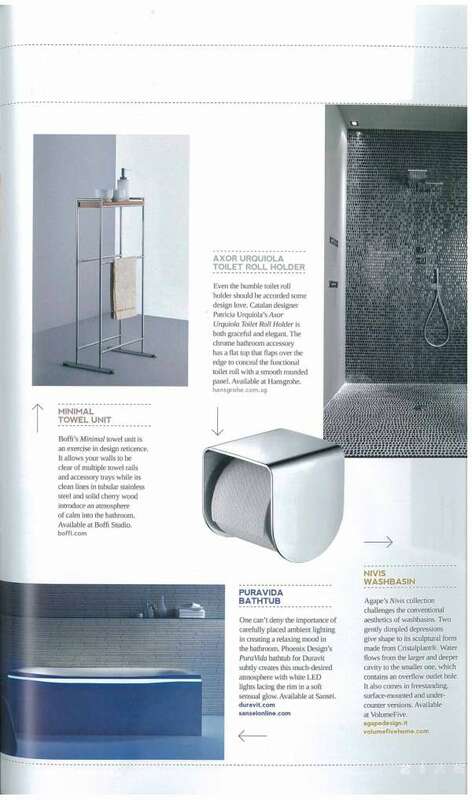 Shower yourself in luxury with Cristina Rubinetterie Showers. 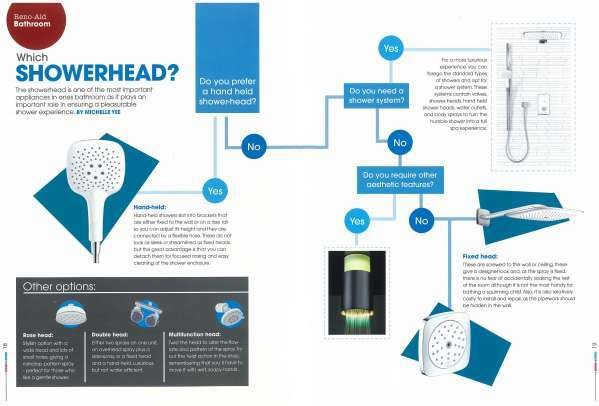 The Sandwich Plus showerhead is made by sheets of stainless steel welded together and it is presented in many different shapes and in various dimensions. Thanks to the extreme thinness, the water flows over the entire surface of the interior in a uniform manner. The result is a jet with a truly rain-like effect. 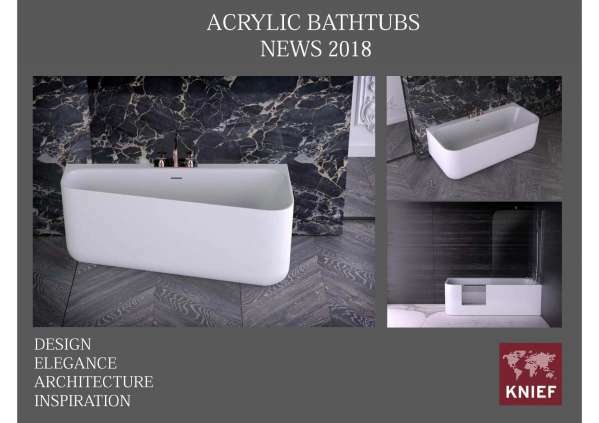 Designed for KOS by the Italian design team Ludovica and Roberto Palombam the Faraway bathtub was conceived from an analysis of organic, asymmetrical geometry combined with a fluid, sensual form. Constructed from Cristalplant (a non-toxic composite material with a high percentage of minerals), the deceptively simple form of the free-standing bathtub conceals the complex mechanics of an energy saving structure and a well-designed, ergonomic shape that conforms to the contours of the human body. The contemporary sculptural lines combined with functionality and comfort bring a luxurious, dream-like quality to bathtime. Designed by Raul Barbieri, this new collection is stamped with the company's commitment to style and quality. 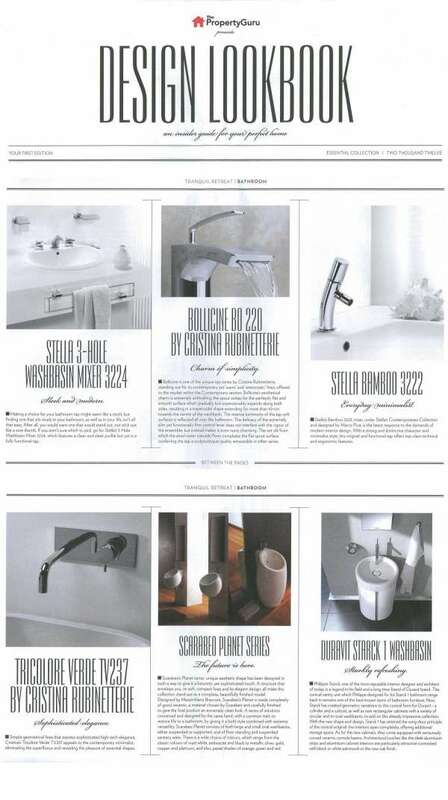 Regardless of what you choose from the line of elegant and high tech faucets, Zucchetti's Mini Spin will definitely be the perfect addition to your bathroom.